Learn more about the Lorex Powerful 32-Camera HD 4K Security System. Find pricing, and answers to common questions. 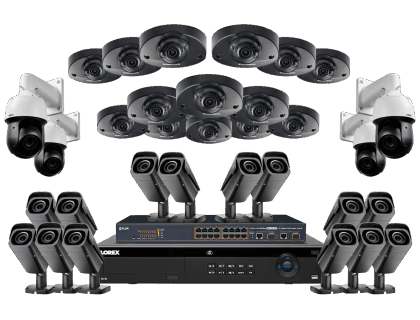 The Lorex Powerful 32-Camera HD 4K Security System comes with a 32-channel 4K Network Video Recorder (NVR), a 16-channel PoE switch, and three types of cutting-edge security cameras. Other features of this Lorex security system include listen-in audio and color night vision. 14 audio dome + 14 bullet + 4 PTZ cameras. 4K NVR can support up to 32 cameras. 250 ft. maximum night vision range. Pros: Built-in microphone enables listen-in audio recording. DNR technology filters noise out caused by motion. Cons: Not that affordable for smaller businesses. Bottomline: State-of-the-art system includes all the features your business would ever need for security. What are some alternatives to the Lorex Powerful 32-Camera HD 4K Security System? Where can I buy the Lorex Powerful 32-Camera HD 4K Security System? The Lorex Powerful 32-Camera HD 4K Security System is available via Amazon and the Lorex website. Does the Lorex Powerful 32-Camera HD 4K Security System work at night? Yes. It comes with nocturnal security cameras with high-powered infrared lighting that can see in complete darkness. With the addition of external lights, the night vision range of this system reaches up to 250 ft.
Its Color Night Vision technology (CNV) enables this system to capture details such as the color of cars and people's clothes up to 175 ft in ambient light. With little or no external light sources, the night vision remains in black and white. Can the Lorex Powerful 32-Camera HD 4K Security System be used in any weather? Yes. The Lorex Powerful 32-Camera HD 4K Security System comes with IP66-rated security cameras that have been tested extensively in all weather, and can withstand temperatures from -22 °F to 140 °F. Its LNZ44P12B camera operates in temperatures ranging from -40 °F to 158 °F.